Dr. Nickel is a fellowship-trained orthopedic surgeon specializing in hip and knee surgery. 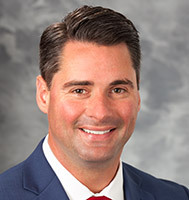 His expertise includes hip and knee reconstruction and replacement with emphasis on minimally invasive techniques and rapid recovery. Well-versed in modern, state of the art techniques and technology, his treatment philosophy emphasizes a patient-centered and specific practice that utilizes the best procedure, implant, approach and navigation for each individual. He has a particular interest in returning all patients to their highest possible function using tailored treatment options, particularly in young, active patients with hip and knee pathology. Dr. Nickel is a Waupun native and graduated with honors from Johns Hopkins University for his undergraduate. He returned to Wisconsin to attend the Medical College of Wisconsin where he got his medical degree and graduated with distinction in research. Dr. Nickel completed his residency at Duke University and his fellowship at the Hospital for Special Surgery. A prolific surgeon, educator and researcher, Dr. Nickel has been recognized with numerous clinical and research awards at national and international meetings.